What tips do you recommend for making a bathroom safer and more functional for seniors. My 79-year-old mother slipped and fell getting out of the shower last month, and I'd like to modify her bathroom a bit with some safety features that can help protect her. Because more accidents and injuries happen in the bathroom than any other room in the house, this is a very important room to modify for aging in place. Depending on your mom's needs, here are some tips for each part of the bathroom that can make it safer and easier to use. Flooring: To avoid slipping, a simple fix is to get non-skid bath rugs for the floors. Or if you want to put in a new floor get slip-resistant tiles, rubber or vinyl flooring, or install wall-to-wall carpeting. Lighting: Good lighting is also very important, so install the highest wattage bulbs allowed for your mom's bathroom fixtures and get a plug-in nightlight that automatically turns on when the room gets dark. Bathtub/shower: To make bathing safer, purchase a rubber suction-grip mat, or put down adhesive nonskid tape on the tub/shower floor. And have a carpenter install grab bars in and around the tub/shower for support. If your mom uses a shower curtain, install a screw or bolt-mounted curtain rod, versus a tension-mounted rod, so that if she loses her balance and grabs the shower curtain the rod won't spring loose. Another, pricier option is to install a walk-in-bathtub or a prefabricated curbless shower. Walk-in tubs have a door in front that provides a much lower threshold to step over than a standard tub. They also typically have a built-in seat, handrails and a slip resistant bottom and some have therapeutic spa features with whirlpool water jets and/or bubble massage air jets. Curbless showers have no threshold to step over, and typically come with a built-in seat, grab bars, slip resistant floors and an adjustable handheld showerhead. Prefabricated curbless showers and walk-in-tubs typically cost anywhere between $2,500 and $10,000 installed. Toilet: Most toilets are about 14 to 16 inches high which can be an issue for many people with arthritis, back, hip or knee problems. 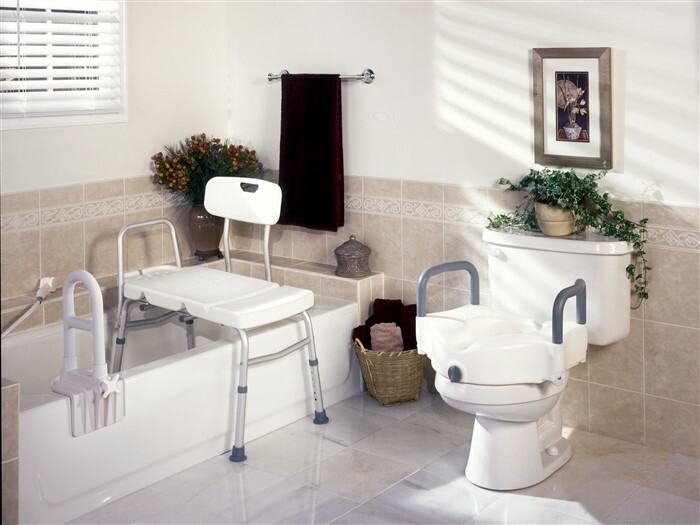 To raise the toilet height, which can make sitting down and getting back up a little easier, you can purchase a raised toilet seat that clamps to the toilet bowl and/or purchase toilet safety rails that sit on each side of the seat for support. Or, you can install an ADA compliant toilet that ranges between 17 and 19 inches high. Faucets: If your mom has twist handles on the sink, bathtub or shower faucets, replace them with lever handle faucets. They're easier to operate, especially for seniors with arthritis or limited hand strength. Also note that it only takes 130-degree water to scald someone, so turn her hot water heater down to 120 degrees. Entrance: If your mom needs a wider bathroom entrance to accommodate a walker or wheelchair, install some "swing clear" offset hinges on the door which will widen the doorway an additional two inches. Emergency assistance: As a safety precaution, purchase a waterproof phone for the bathroom or get a medical alert device (SOS emergency call button) that your mom could wear in case she falls and needs to call for help. You can find all of the products suggested in this column at either medical supply stores, pharmacies, big-box stores, home improvement stores, hardware and plumbing supply stores as well as online.